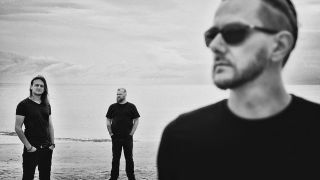 Riverside have announced that they’ll continue as a trio following the death of guitarist Piotr Grudzinski. Grudzinski died in February this year aged 40 after suffering a heart attack. As a result, the band put all activities on hold while they decided if they’d carry on without their founding member. Now Mariusz Duda, Piotr Kozieradzki and Michal Lapaj have released a statement confirming they’ll continue – and plan to play their first live set on the anniversary of Grudzinski death. The band say: “We have decided that we are not going to do a casting for a new guitarist. Thus we have ceased to be a quartet and have become a trio. In this lineup we will prepare our new studio album. Both in the recording studio and on tour – if we get back to touring – we will be playing with session guitarists, who are our friends. But the lineup of Riverside will be as shown in the picture. “Yes, we do realise that this is not going to be the same band. We know that for many of you the story of Riverside ends here, this year, and that Eye Of The Soundscape might be the last Riverside album you’ll buy. Riverside say they want to be “living proof that giving up is not an option” and report they want to be an inspiration to others. The band add: “Grudzinski will still be with us. We are definitely not going to forget him. He’s a part of our lives – but in order for the memory of him to survive, we have to continue. And we want to. So we’re embarking on another journey and we are thankful to everyone who will join us. “Next year we’re going to start working on a new album. Marked by the circumstances, it will probably be a return to heavier and more intense sound. But before that, in February 2017, on the anniversary of Piotr’s death, we’d like to play our first gig. Riverside will announce show details in the coming weeks.